Welcome to Fr Neil Brett: He was born outside of Hadrian’s Wall in Gosforth, near Newcastle. He was brought up in a non-Conformist family with a strong habit of prayer and high moral standards and educated at the local Grammar School. At University he took a first degree in education and started teaching in London. Drifting from the faith for a while before finding East-End Anglo-Catholicism, he then realised the need for the Church and Apostolic Succession. Fr Neil was received in 1993 at Farm Street. In the late 1990s he worked in Westcliff on Sea and then took a headship in Portsmouth. Responding to the call of priesthood, he spent 6 years at the English College in Rome and was ordained in 2010. He spent 5 years in Colchester until he was made parish priest of Upton Park 2 years ago. Fr Lukasz is swapping with Fr Neil this weekend. Lenten Extra Daily Mass: Make the effort to attend one extra Mass each week. St Bede’s have 3 Masses a day and 5 on Thursdays. Stations of the Cross: 5pm Sundays and in school on Fridays. 2nd April: Fr Barry Hallett (Dorchester). Join us for our St Patrick's Night Celebration - Next Saturday (18th March) 7.30pm: Enjoy a 3 course meal and live entertainment. Phone Mick to book the last few places. The night costs £20 per person and the profits will be split equally between St Bede's and a charity. Fr Pawel: will be heading off after the 8am Mass to Warsaw as part of his studies - back on Wednesday evening. Fr Lukasz: will at a Priests Conference in Merville, France this week - back on Friday evening. Fr James Maudesley: It was nice to welcome him this past Thursday. He said the 12.30 Mass and later gave a talk to the UCM about his imprisonment in Burma and his call to the priesthood. Monthly OAP Luncheon - Chef(s) needed: We would like to restart this club but we need some volunteers to cook. Please speak to Fr Chris this weekend if you would like to offer your services! Vacancies at BTG School: The school has two vacancies at the moment – Maintenance Officer (required ASAP) and Casual Examination Invigilators. See the notice boards or CLICK HERE for more information. Fr Simon Leworthy's 25th Anniversary of Ordination: tomorrow (13th March). If you would like to send him a card etc - his parish’s address is: Our Lady & St Peter’s Rectory, 32 Victoria Road, Bridlington, East Yorkshire, YO15 2AT. Ursuline High School Wimbledon - Celebrating 125 Years (1882-2017): Alumnae Event 13th July 2017 - If you are a former student or know someone who is, who may be interested to learn more, please register your interest email Alumnae@uhsw.com. 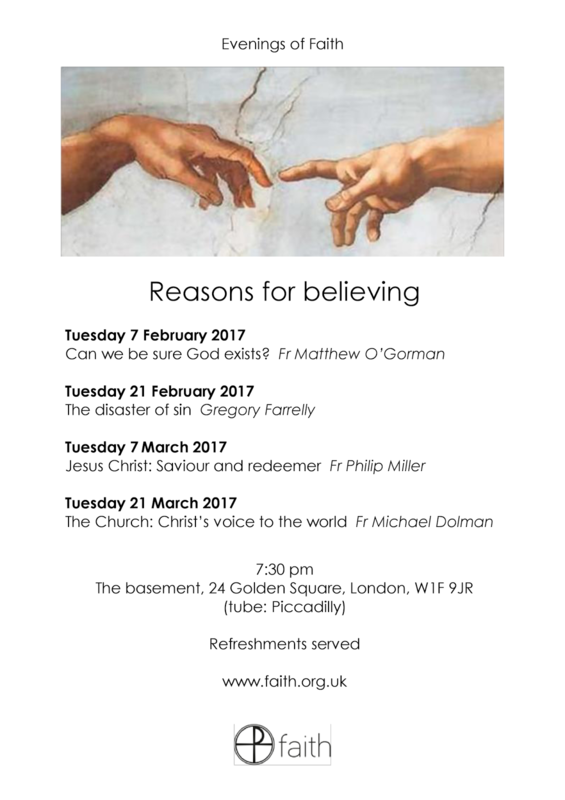 London Evenings of Faith- February & March 2017: All are welcome to a series of talks on 'Reasons for believing’ which will take place at 7:30pm on alternate Tuesdays (the last of these talks will be on 21st March). Talks are held in the basement of 24 Golden Square, London W1F 9JR (Tube: Piccadilly Circus). Full dates and details are available at www.faith.org.uk/events/evenings-of-faith.